My hometown, Walla Walla, has no escalators. None. I love escalators. I can still remember the first one built in Reno, my childhood town. Those mechanical stairs were in a casino. We would slide by a few of the noisy slot machines and head up the escalator to a restaurant on the second floor. 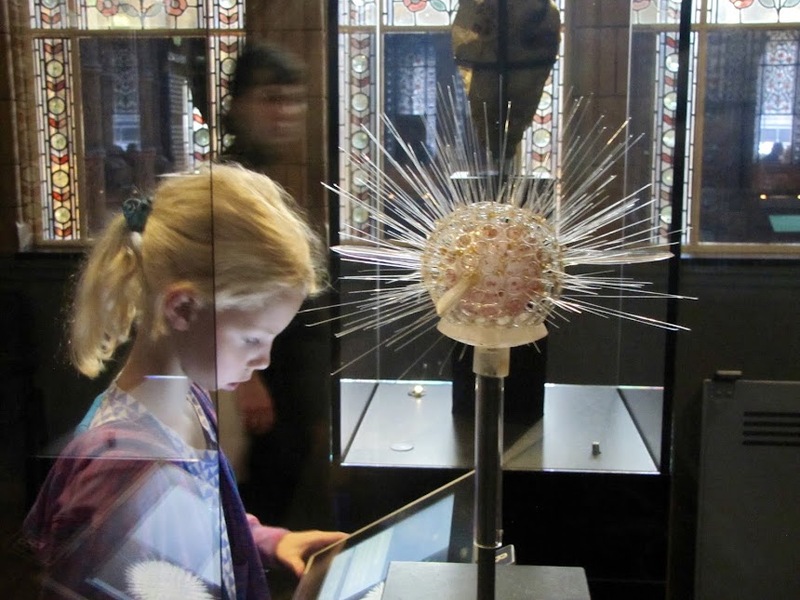 As a child I was fascinated. The stairs seemed like they were drawing you into a dragon's mouth somewhere above you. The scale-like steps were worrisome and enchanting all at once. Those scaly stairs could catch you up and deliver you captured at the top. When I would arrive safely after all, I would feel a little skip of the heart, a little pride at not being captured by the escalator. 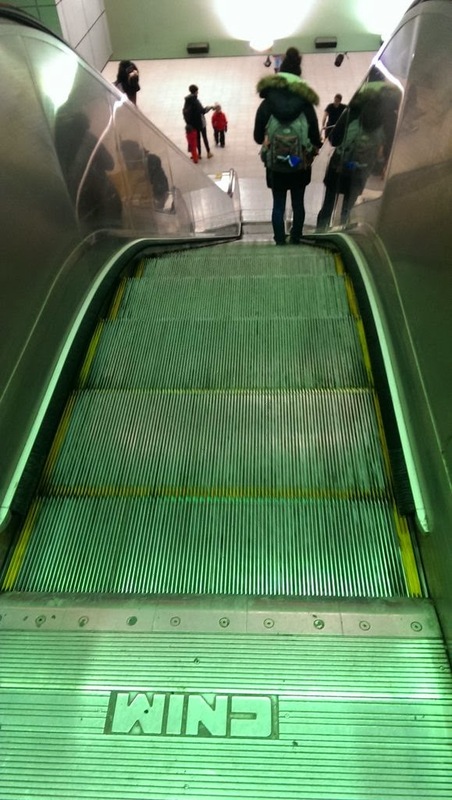 Here in Montreal you are usually given a choice in the Metros: stairs or escalator up and down and up and down. I usually choose the escalators. The stairs in this city are, however, worth a note. A couple of weeks ago I was invited into a home on the second story of one of the common-style of duplexes. 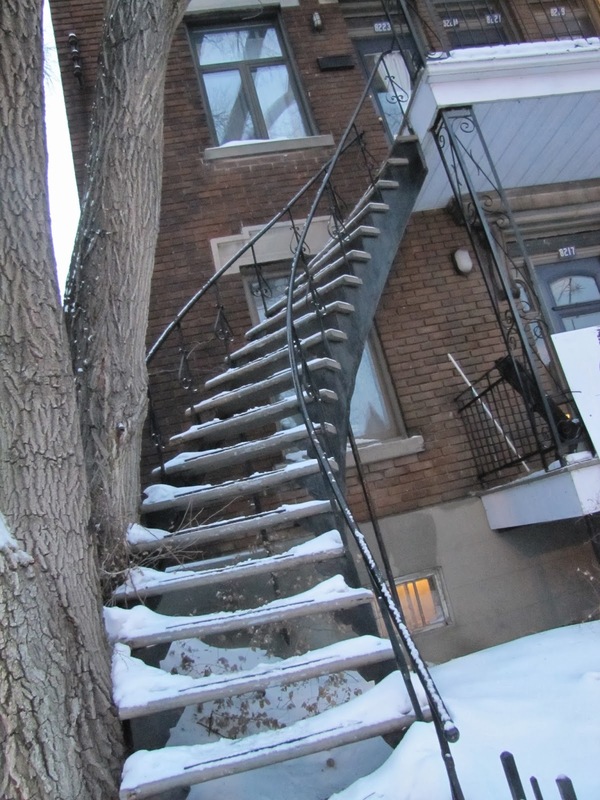 Almost every duplex or triplex has an exterior stairway. 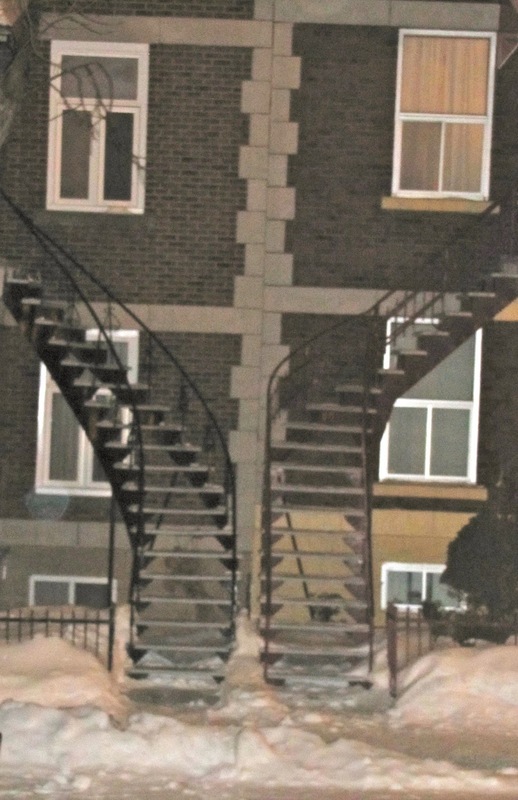 The stairs are wedge-shaped metal stairs curving up tightly. I keep trying to imagine going up and down them with a toddler or two, totting a baby carriage and groceries. 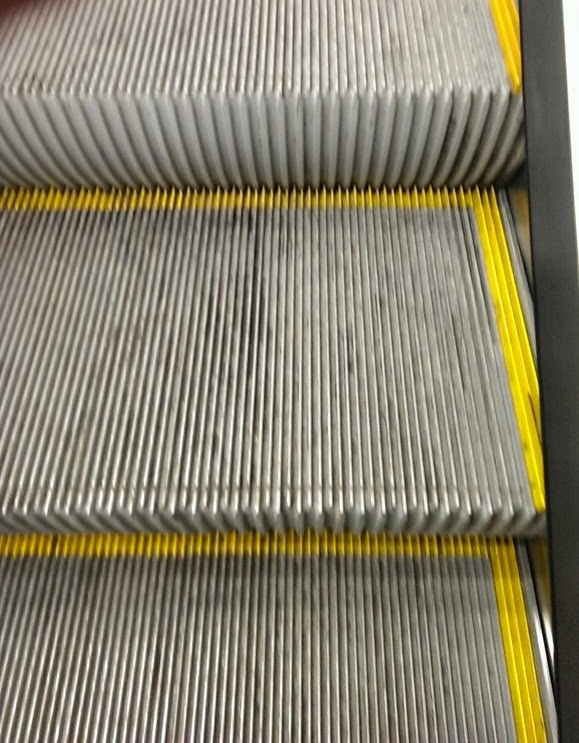 They are scarier than those escalators and thrice as dangerous in the icy weather. Looking down isn't like looking into a dragon's mouth, but more like looking down a slide on a curving dragon's tail. These outside stairways have been puzzling me since I arrived. I can understand having stairs outside to save room inside, both in heating bills and space, but still. Saturday I went to the Museum of Archaeology and History and the puzzle of the stairs has been solved. In the 1850's when immigrants from Europe began arriving in significant numbers, four Montreal developers came up with a solution. They designed first duplexes and than triplexes all in neat grids with alleys in the back for deliveries. However the Catholic church was worried about those inside stairways in the the triplexes. They could be the scene for immoral behavior. More over individuals from different families would have to pass each in tight circumstances. Worrisome. The church managed to convince the Catholic builders that their reasoning was worth listening to. Hence, the outside staircases came into the plans. I wonder how many souls have gone to heaven trying to navigate their treacherous stairs! I find myself appreciating escalators more and more. What would the church of the 1850's have thought of this housing development? Thrown up by the devil himself. A plan in which one could loose your way and arrive at the wrong home entirely. And those interior staircases! Habitat67 was designed by a 23 year-old student, Moshe Safdie. His thesis project for a prefab housing structure was chosen to be build for housing for dignitaries during the Expo 67 of Montreal. Every unit has room for a garden space, the complex has numerous amenities and sits directly on the St. Laurence River. The units have very little turnover. This winter photo is pretty bleak looking, but do look up some Internet sites for this building. Montreal would have looked quite different if Moshe had been the early developer of Montreal. I particularly like the safe stairways!